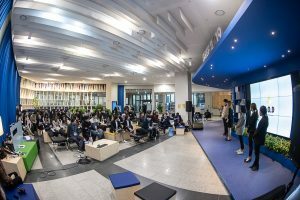 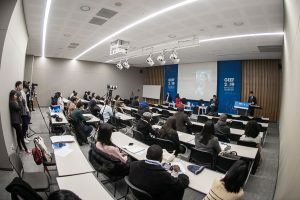 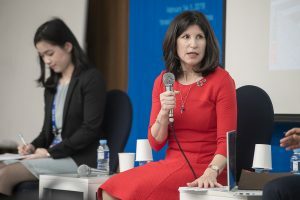 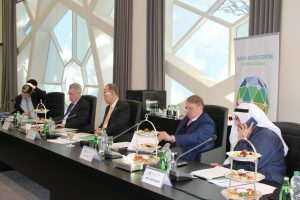 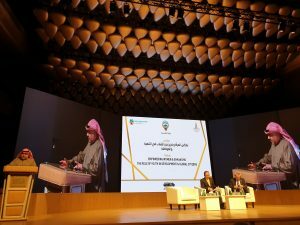 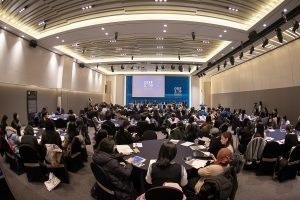 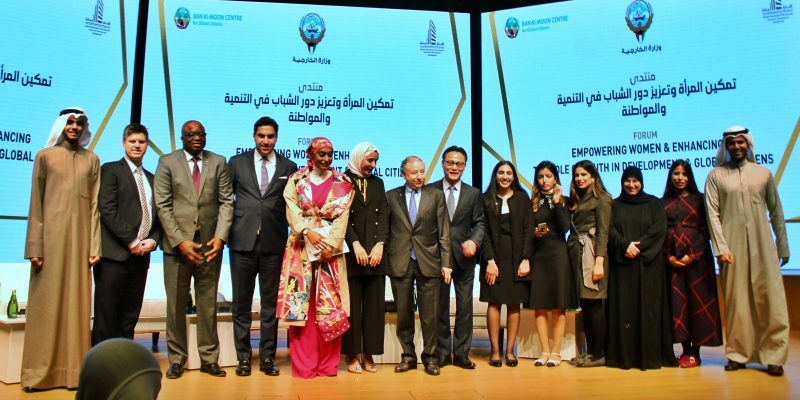 In cooperation with the Ministry of Foreign Affairs and the General Secretariat of the Supreme Council for Planning and Development of Kuwait, the Ban Ki-moon Centre for Global Citizens co-organized the symposium on “Empowering Women and Supporting Youth in Development and Citizenship” in Kuwait on February 12th, 2019. 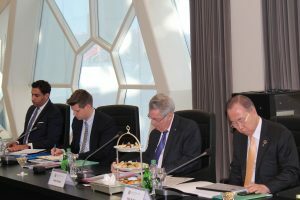 At the opening, BKMC Co-chairs Ban Ki-moon and Heinz Fischer delivered a keynote. 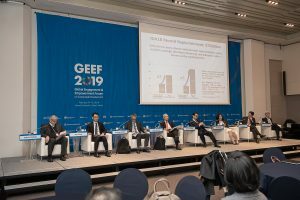 “Realizing the Sustainable Development Goals will improve the environment for doing good business and building markets. 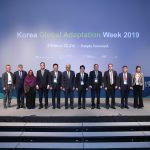 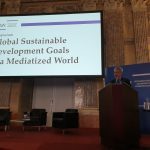 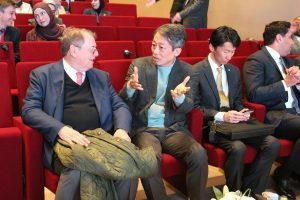 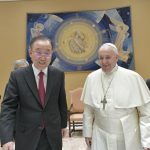 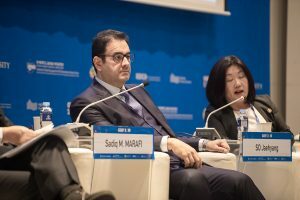 Trillions of dollars in public and private funds are to be redirected towards the SDGs, creating huge opportunities for responsible companies to deliver solutions,” said Ban. 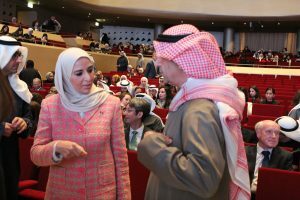 He also shared the deepest appreciation to the Centre’s Board member, Ambassador Sadiq Marafi, praising his commitment to supporting the Centre from the beginning and to all his collaborative initiatives to foster women’s empowerment. 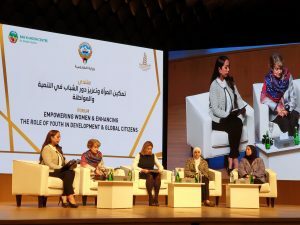 The 1st session of the symposium was entitled “Empowering Women,” featuring women leaders and representatives from both public and civil sector. 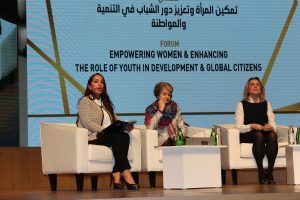 BKMC Board members Irina Bokova, former UNESCO Director-General, and Andrea Pfanzelter, KACIID Senior Advisor, were featured as panelists of the session. 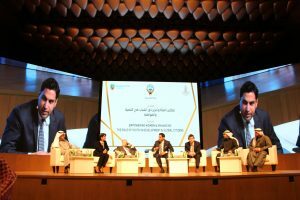 For the 2nd session entitled “Youth Role in Development and Citizenship,” representatives of a specialized center in supporting youth development in Kuwait and from the civil society, a graduate student from Kuwait University, as well as BKMC Board members were featured. 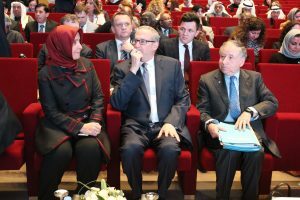 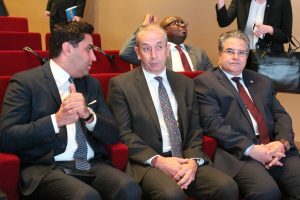 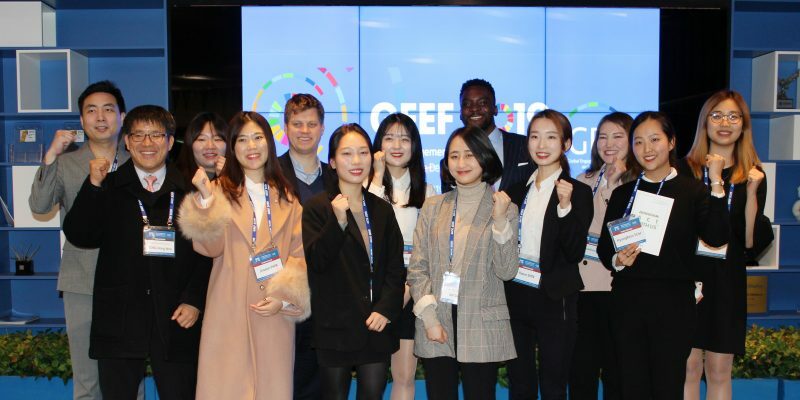 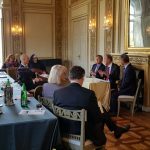 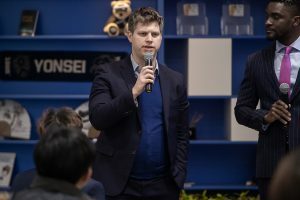 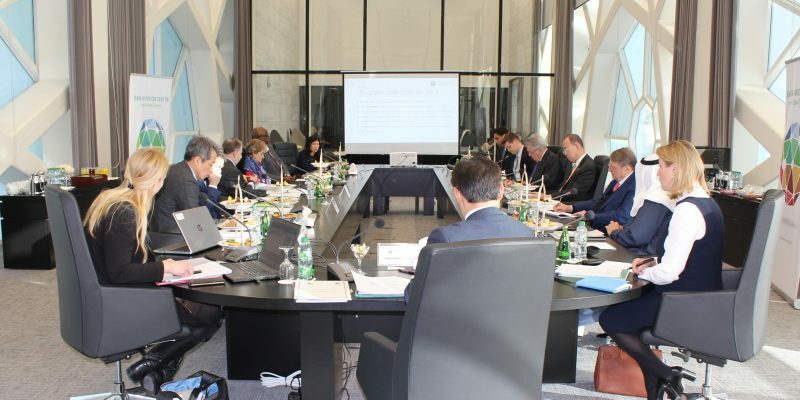 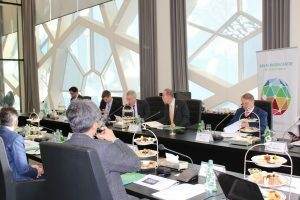 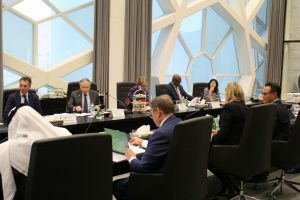 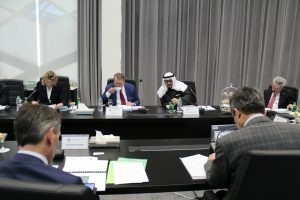 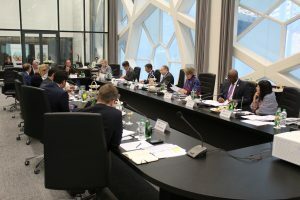 The featured Board members of the Centre included Jean Todt, FIA President, Ahmad Alhendawi, Secretary-General of the World Organization of the Scout Movement, and Michael Sheldrick, Global Citizen Vice President. 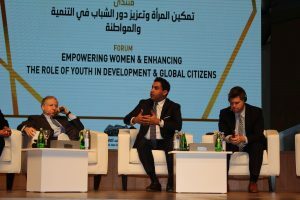 The last session entitled “Role and Efforts of Private Sector in Empowering Women and Supporting Youth in Development” featured representatives from Zain Telecommunication, Kuwait National Bank, and private sector. 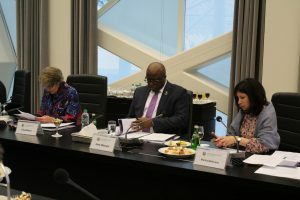 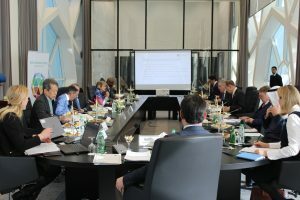 On February 11-12th, the 3rd Board meeting of the Ban Ki-moon Centre for Global Citizens took place in Kuwait. 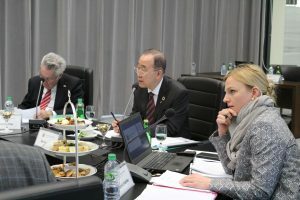 The ‘Why Group’ (Márcia Balisciano, Susan Myers, Arrey Obenson, and Michael Sheldrick) of the Centre presented a document based on their discussion on the “Why” of the Ban Ki-moon Centre, suggesting clearer vision and missions, measurable projects and investments, and the Centre’s position in correlation with its Co-chairs and Board members.